Mullarkey’s Clearances are a leading waste disposal contractor working in and around the North London area, we are here for all your rubbish collection and waste removal needs. We offer our services in local areas including Barnet, Finchley, Muswell Hill, Crouch End, Islington and Camden areas. 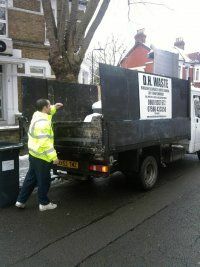 Our North London rubbish clearance company class ourselves as a refreshing skip alternative, this means that instead of ordering a skip and arranging permits, suspensions and having to load it all yourself, plus the hassle of having that unsightly skip sitting outside your house with the risk of random people filling it up, we arrive, load and dispose of all your waste quickly and correctly. Yes its that simple, all it takes is one phone call and and we will try our best to give you a quote on the phone but if that isn't possible we can come and quote for free, yes all quotes are absolutely free. By using us you have that piece of mind knowing that everything that can be recycled is recycled. All our waste is transported to recycling centres where there is a team of guys waiting to sort through the waste, extracting all wood, metal, soil, cardboard and rubble to name but a few, making sure as little as possible is sent to landfill. Mullarkey’s Clearances specialize in all types of house, office and waste removal in North London, we can dismantle and dispose of sheds, collect and dispose of rubble and soil, collect and dispose of a garage or lofts contents, if your doing home improvements we are here to collect and dispose of all your builders waste, garden clearance, we can come, load and dispose of just about anything. We operate in Camden, Islington, Crouch End, Muswell Hill, Finchley and Barnet. At Mullarkey’s Clearances, Rubbish Clearance London take pride in our work, yes people may say that we are only dealing in junk removal service but we understand that from passed experiences with our customers that disposing of some waste can cause a lot of stress and hard work, we are here to take that stress away and remember we do all the hard work. So if you have anything that needs removing or collecting for disposal please pick up the phone, you have absolutely nothing to lose as its free for us to come and quote. Mullarkey’s Clearances are licensed by the environment agency and are approved licenced carriers. Any company must have a waste licence to legally collect your waste, please do not allow someone to collect your waste without first asking to see there waste licence. Once there licence has been produced you can be confident that your waste is going to be disposed of correctly. The law states that you the customer are just as responsible for the disposal of your junk as the person who has been chosen to collect it. This means if you allow your waste to be collected and the person then fly tips it you are just as liable as the fly tipper himself, so please beware of cheap quotes and ALWAYS ask to see a valid licence.